This is a pretty pink and purple diagram of the heart so you can see exactly what the heck I’m referring to. I never really understood the heart. I mean, sure, it pumps warm oxygenated blood through your body so that you don’t croak and you can live a long happy life playing bridge and watching soaps. Holding a Bachelor’s degree in Biology, you’d think I had this whole circulation system thing down pat. Nope. Nope, I don’t. (Tetris was far more interesting). Well, I didn’t until now. First of all, you have four chambers in your heart. Two on each side. You have your left atrium, your left ventricle, your right atrium, and your right ventricle. (Your right and left, not mine). You’ve got arteries and veins going in and out of your heart too. You’ve got your inferior vena cavae (IVC) and superior vena cavae (SVC)that feed your heart used up blood (blood that the rest of your body has already feasted on). Follow? You’ve also got an aorta that is like the main tube that supplies all the nice oxygenated blood to the rest of the body… to feast on. So! Your blood goes into your right atrium through your IVC and SVC. It gets pumped through the tricuspid valve to the right ventricle. So just think of little holding chambers. The blood (still nasty used up blood) goes from the right ventricle to the pulmonary artery! Yes! It goes to the lungs NOT the other side of the heart. Ah, take a deep breath. Kudos for oxygenating your blood! Moving on. So now after the carbon dioxide (what your body puts back into your blood in exchange for the lovely oxygen) has been removed and oxygen has been put back, the blood moves back into your heart through the pulmonary vein. The pulmonary vein brings the blood to the left atrium (atrium to ventricle, always. A is before V, alphabetical order.) 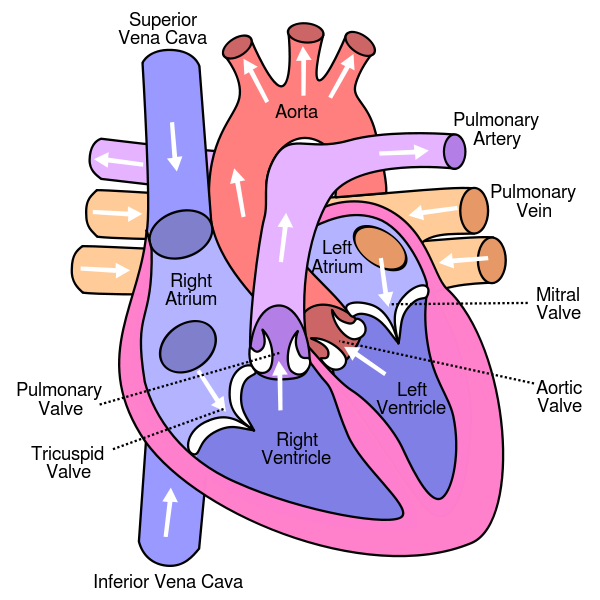 From the left atrium it goes through the mitral valve to the…. Left ventricle. You guessed right! Your lovely oxygenated blood gets passed through the aortic valve into the aorta. The aorta is like a big tube that feeds the rest of the body sending oxygen up, down, and around so every bit of you can get the blood it needs. Got it? Now how does the heart do all this? No, it does not get to feast on the blood that it is pumping to the rest of the body. Instead, the coronaries (coronary. Sounds familiar? Coronation ball? Crowning? No? Yes! Coronaries crown the heart!) So there are two little openings that lead to the coronary arteries. These go around the outside of the heart and feed the heart oxygenated blood so the heart can keep on living. The used up blood (deoxygenated) goes to coronary veins that empty into the right atrium! What kind of blood goes into the right atrium? Deoxygenated blood from the rest of your body. So! It just gets swept away to the lungs to get oxygen. Again. And again. And again. Light bulb going off yet? Next > 25 tomorrow, does that mean I have to grow up?